Charles Hood is a rising sophomore at North Carolina State University studying Electrical and Computer Engineering. What inspired you to learn design? My major is a dual degree program in electrical and computer engineering. While electrical engineering usually doesn’t have direct links to mechanical design and CAD, product development and research takes advantage of a diverse number of fields. While working on a project alone or without the resources of a large team, you need a larger skillset to develop an idea—that’s why I wanted to learn about design, so I could pursue my ideas on my own. Where do you get inspiration for your creative projects? Usually my projects start from a simple thought: I want something, I need something. And after the initial outline to build it, I usually want to add more to it. It sounds cheesy, but if you thoroughly research what you want to do and take your time, you usually can find a solution – or an idea. 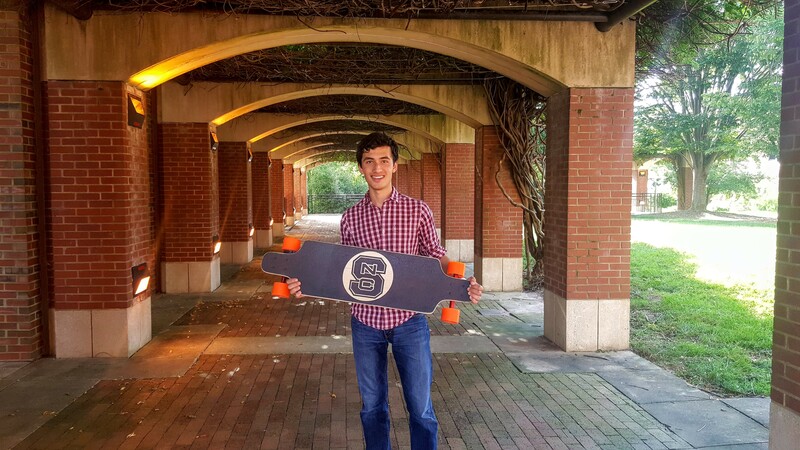 Tell us more about the Longboard you are making with Fusion 360. How has using Fusion 360 helped you with this project? 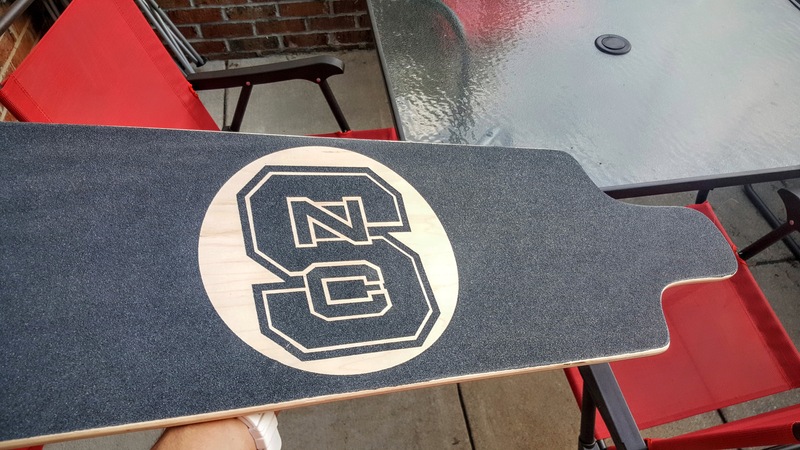 When I first came to NC State, I saw an electric longboard and thought, “I wish I could make something like that.” Unfortunately, the MSRP for a fully assembled longboard started at $1000. However, I realized that at my university I had resources at my disposal, and so I started researching how to make one. I planned for months, researching different topics, aspects, prices...the list continues. Slowly, I began to gather parts and compile a large bill of materials. While the end product is simple, developing it is a challenge in itself. There are many moving parts (not just literally), and planning is essential. Just buying parts and trying things results in either broken parts or a poorly designed product. My end goal is to have a prototype that is close to, in design and functionality, a consumer product. As a student Fusion 360 Catalyst intern, I really push the “concept to product” idea that the Fusion 360 platform enables. Having one software that I can use from the first ideas I have all the way through my design process really helps increase workflow in such a long project. From the initial design concepts to the mounts, CAM integration, and finally the renders and simulations for when I have a finished product, I like to emphasize that you can use it start to finish. 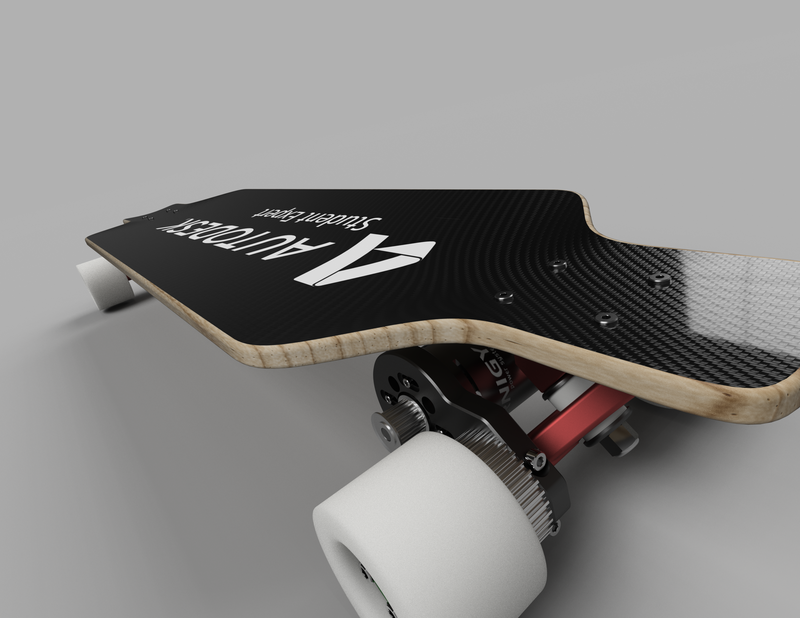 Fusion 360 render of the longboard. Drivetrain: The drivetrain needs to be robust. Not only do I expect it to get me from place to place, but if I use it every day it needs to be reliable. Regular CNC’d 6061 Aluminum mounts the RC motor to the wheels firmly. 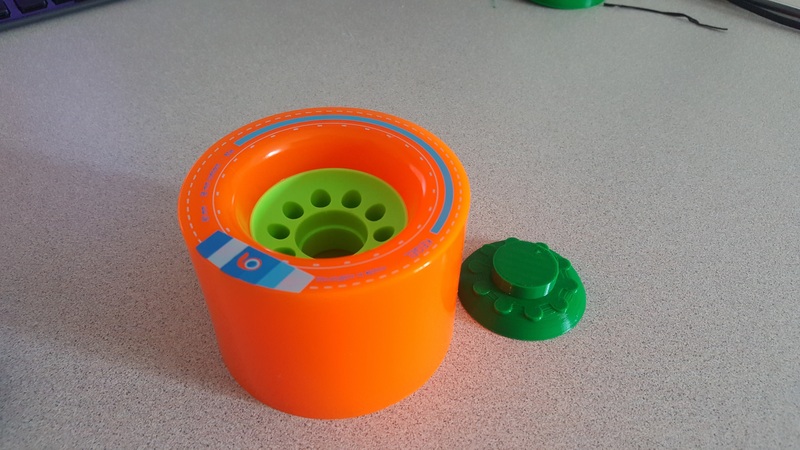 The 15mm belt and corresponding pulleys are also solid. 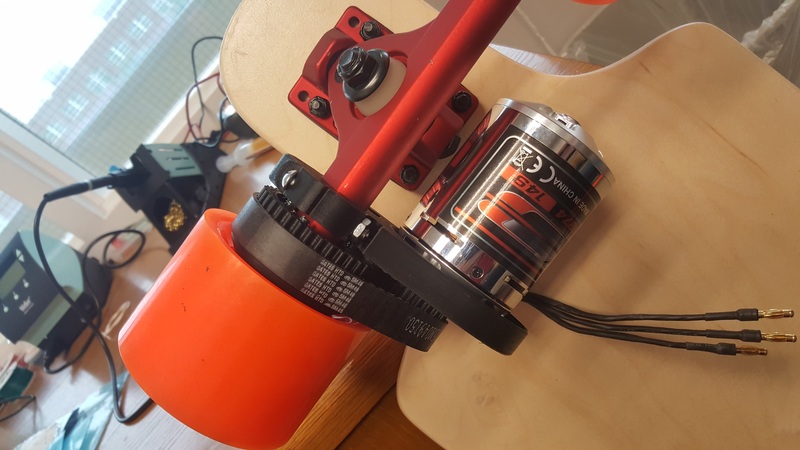 The aluminum pulley on the motor is at a ratio of ~1:2.5, and with an already low RPM motor (149kV), there should be enough torque to pull big hills and ride relatively fast on flat streets. Designing the wheels in Fusion 360 and importing STEP models of the gears allowed me to create custom parts that fit exactly as they were made. Controller: One of the most important aspects of an electric longboard is that you can control it. I’m currently developing a Bluetooth ring full of sensors. The wearable movement is in full swing. Having the resources to build the circuits is the fun part. With thousands of different sensors commercially available and Fusion 360 to design any accompanying CAD, the possibilities are endless. I have no intentions of creating a startup like the already 15+ different companies making electric longboards. However, I aspire to have a (give or take) consumer-ready product by the end of this project. Especially taking into consideration that I plan to use it for transportation around campus, the batteries will need to be recharged regularly. RC Hobby battery chargers aren’t going to be sufficient. They start at $100, take hours, and the charger itself is too large to keep anywhere except at home, which leads me to a full battery management system (BMS) built into the board that can handle charging high voltage, high capacity Lithium Ion batteries. Buying a chip, for example the MCP73871 and associated components might cost $3. However, it only charges one, 3.7V Li-Po Battery. Making a robust charging controller that can handle 10-series battery packs as well as incorporate all the safety features that are especially important when charging/discharging Li-Po batteries (Voltage/current protection, coulomb counting, temperature, etc.) is a challenge. I’m using the 300+ page documentation for the current Texas Instruments Analog Front End with the accompanying Fuel Gauge has for help in building a robust battery management system in terms of both hardware, and software. 3D printed motor mounted bracket. What would you like to do after college? I might be interested in getting my Master’s degree, but more likely I will start with a company right out of college. I enjoy designing and creating working products. So, whether it’s research in applications of new technology or product development for new devices, I want to be involved in the big picture. The final outcome is what I enjoy being a part of.